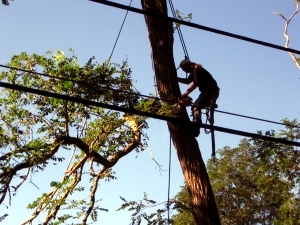 Whether it's for safety, health or clearance, tree trimming is the most important thing you can have done for your trees! Tree trimming improves the health of your trees by removing broken, diseased or dead branches which impedes decay-producing fungi from spreading. Live branches may be removed or thinned out to promote health and vigor as well as to increase the structural stability of a tree. Pruning trees improves air flow between the branches and allows for better sunlight penetration. Some branches that overhang driveways, walkways or buildings pose a safety hazard and will need to be pruned. Branches that are too close to power wires may cause damage during storms and it's better to take care of them ahead of time rather than after they cause damage.